“I never thought I’d be cold in the Amazon,” my husband quips as he buttons up his long-sleeved shirt. It’s August, but cool breezes keep us comfortable as our guide motors the skiff we’re riding in towards a tributary of the Amazon River. The weather is just one of the pleasant surprises during our week-long adventure with tour company International Expeditions. We’re on an early morning excursion traveling up river from where our floating hotel, on the 24-passenger La Amatista, is anchored. Along with 13 other people and two guides, my husband and I will travel 65 miles this day deep into the protected Pacaya-Samiria National Reserve, the largest protected wetland reserve in the world. The headwaters of the Amazon originate from glaciers high in the Andes Mountains, and the section through which we’ll travel is entirely in Peru. From there, the river flows eastward for more than 4,000 miles before spreading across miles and surging into the Atlantic Ocean in Brazil. 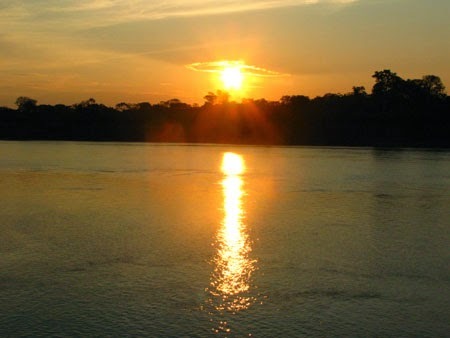 Not just one river, the Amazon includes more than 1,100 tributaries, 17 of which are over 1,000 miles long. The immensity of this river system, largest in the world, is truly hard to comprehend. 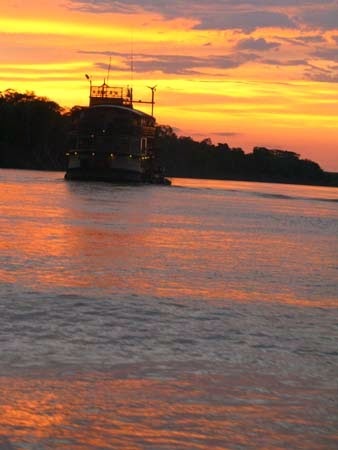 During our first full day on the river our ship splits off from the main channel to a course on one of the largest tributaries, the 300-mile Ucayali River. From there, we board the skiff which cuts cleanly through chocolate-colored water, passing riberenos--river people--trolling from handmade canoes and farming rice on muddy river ledges. Fishermen on flat rafts float down river to Iquitos, a six-day journey, with net enclosures full of catfish they will sell in the city. Birds including parrots make their home in the rainforest. We soon discover why this is a bird-watchers paradise. Thousands of species live in the protected canopy of the rain forest. Several people on our tour really know their stuff and identify dozens of birds including snowy egrets, puffins, king birds, great black hawks, white-winged swallows, terns, and more. To me the birds are simply “the brown one” or “the yellow-beaked one.” We’re amused when Johnny, one of our native guides, excitedly exclaims, “Oh my god, I think I’m going to die!” as he spies a rare bird species. 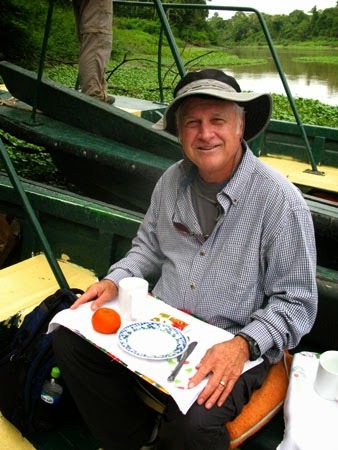 Twice a day naturalist guides take guests on excursions to visit local villages, swim in the Amazon, search for wildlife, fish for piranhas, or trek in the jungle. Even though we’re in a primitive area we’re not really roughing it. The crew provides daily meals and laundry service as well as nightly entertainment. The observation deck is a fine place to relax and visit with other guests as we take in stunning scenery of this great wilderness region. 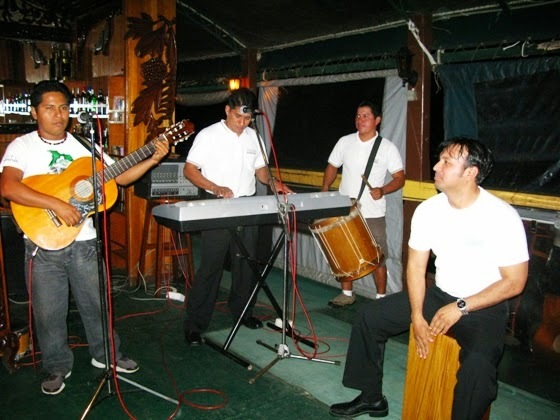 Our crew entertained us with Peruvian music. One morning we leave early on a sunrise cruise. When the skiffs come to a section of flat water the guides serve a full breakfast in style on china plates and lace placemats. 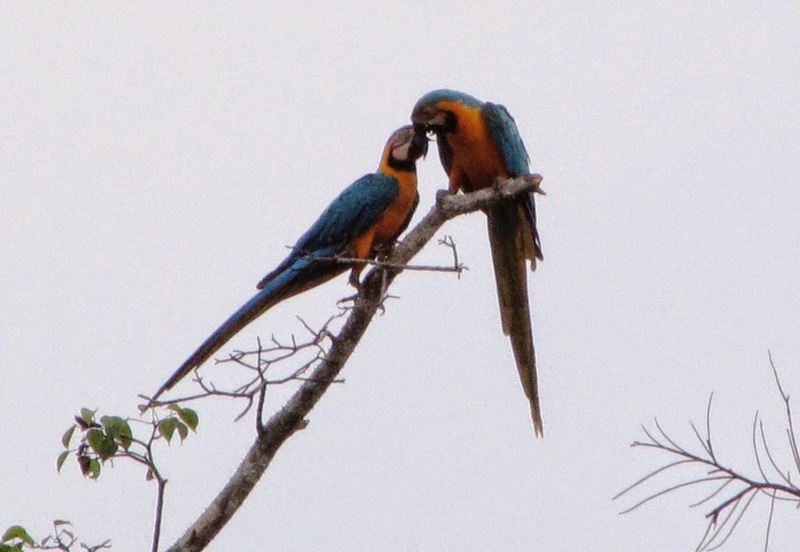 Above us on the bank, graceful blue and yellow macaws provide an unforgettable show as they flit from tree to tree in a mating ritual. 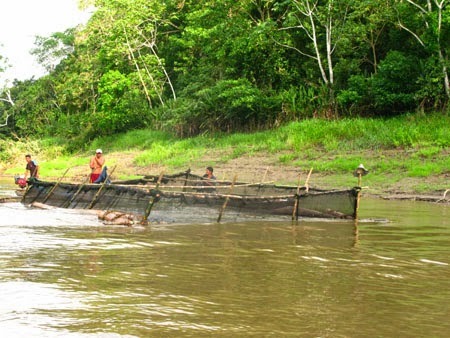 In the afternoon we travel back into the Reserve on the Pacaya River, a branch off the Ucayali. Sustainable living practices—hunting and fishing for personal use—are allowed for the thousands of people who live in and around the Reserve, mostly in small, isolated communities. These riberenos live as their ancestors did, unaffected by modern lifestyles. I did an Amazon trip in Ecuador and your post brought back great memories! 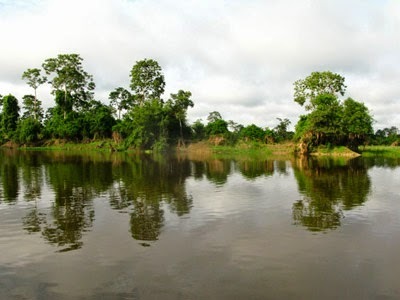 The Amazon is so awesome!